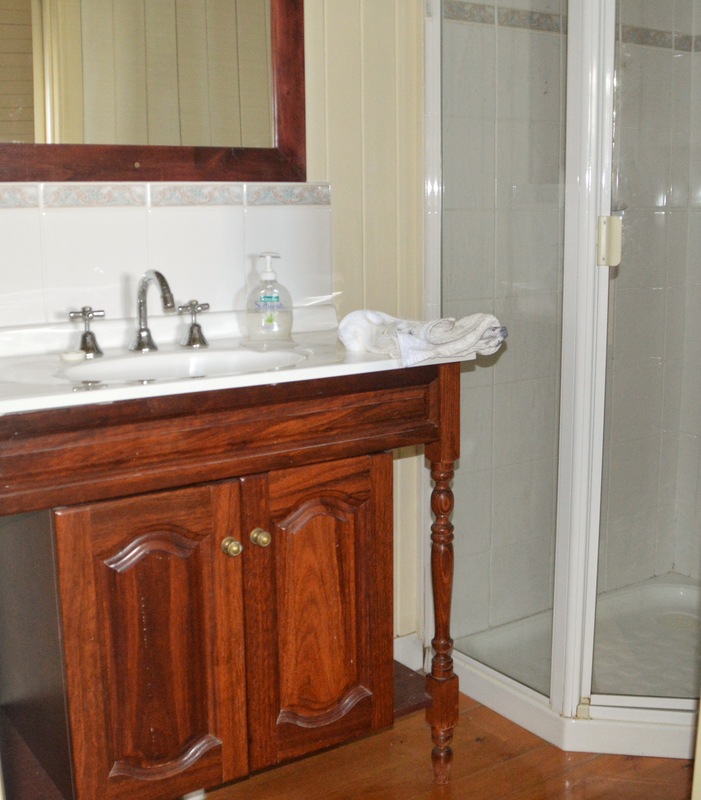 Close to Brisbane CBD, whilst tucked away in one of Brisbanes earliest suburbs, lies Kettle & Tin. 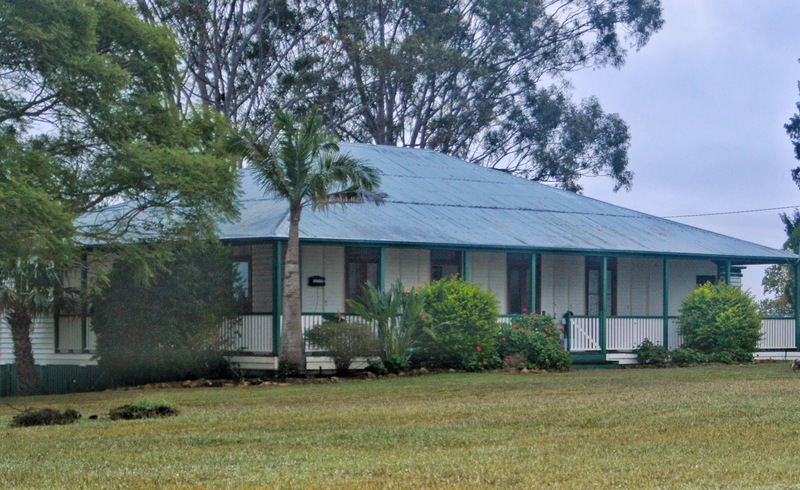 Paddington was first settled in the 1860’s, which resulted in an array of workers cottages and Queenslanders. 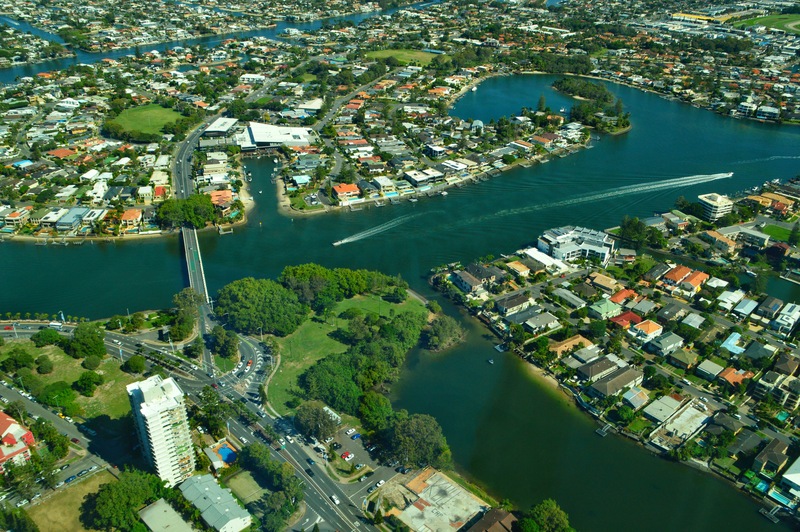 One of these Queenslander style homes, has been converted into an inviting hub named Kettle & Tin. Outside seating morphs easily into the large inside area, with a charming warmth of days gone by, retained. Dotted throughout the area are reminders of a bygone era. Here a kettle, there a minature, but useful, wooden crate, everywhere something to see. As the chill of an early morning winter starts to bite, the inviting warmth of this cafe would be difficult to resist. Couple this, with the genuine smiles from attentive staff, you now have a combination which tempts you in. To the absolute delight of hubby, today’s breakfast menu was an all day menu, which could only mean one thing. He was going to enjoy a burger, for breakfast, with fries or onion rings. Why? Because he could, it was that simple. Burgers not being my breakfast of choice, I opted for banh xeo, otherwise known as a Vietnamese crepe. 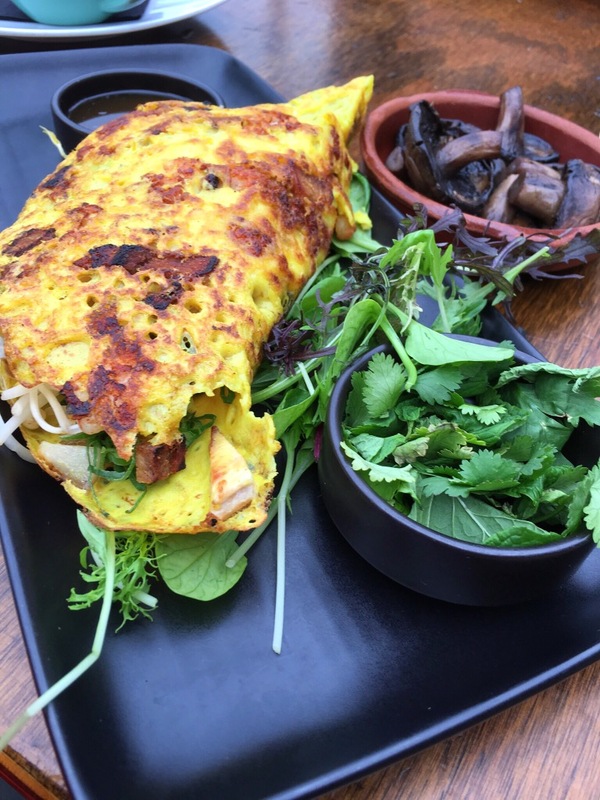 Filled with pork prawns and herbs, this crepe sounded inviting. Presented with the black ground, making the green and crepe colours pop from the plate, the banh xeo arrived at the table, along with my side choice of mushrooms. I would have to say the crepe itself was one of the nicest I have tasted. The filling was mainly bean sprouts with a few pork and prawns woven into the crepe. Personally, I would have preferred more pork and prawns, however, overall this was an enjoyable dish. Aah the burger. 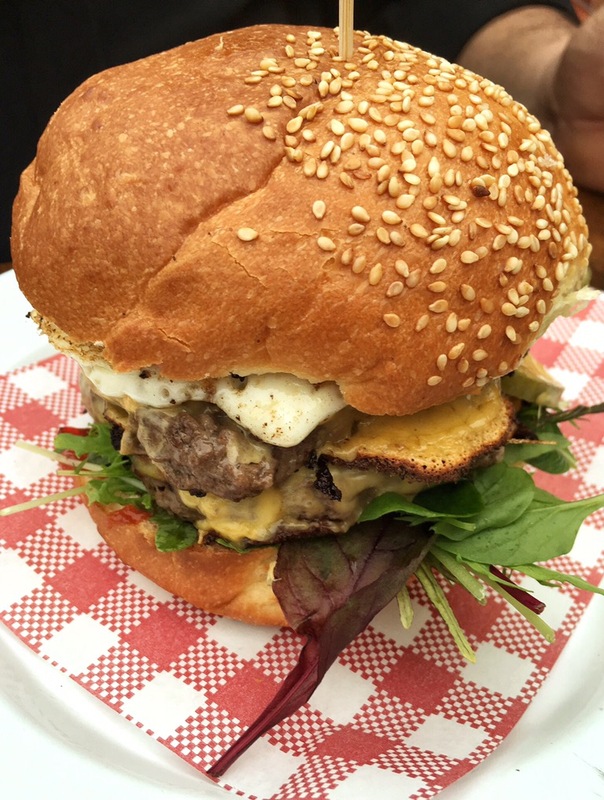 With double patty plus a fried egg, Hubby was in raptures with his choice, drooling over ever mouthful. His final choice of onion rings over fries was definitely a winner. These lightly battered delights played music upon ones tastebuds. I did manage to try one them sneak in another, however Hubby was not prepared to give up too many of these little wonders! Check out the omelette! Oozing Brie, partnered with a side of bacon, this dish was well enjoyed by a friend at our table who savoured every morsel. For those who have followed earlier blogs, you would have picked up on Hubbys taste for caramel lattes. Well he has a new quest now. Recently introduced to chai latte, his mission is now to find the best. Apparently the iced chai latte he tried here, was a very good start to his list of favourites. 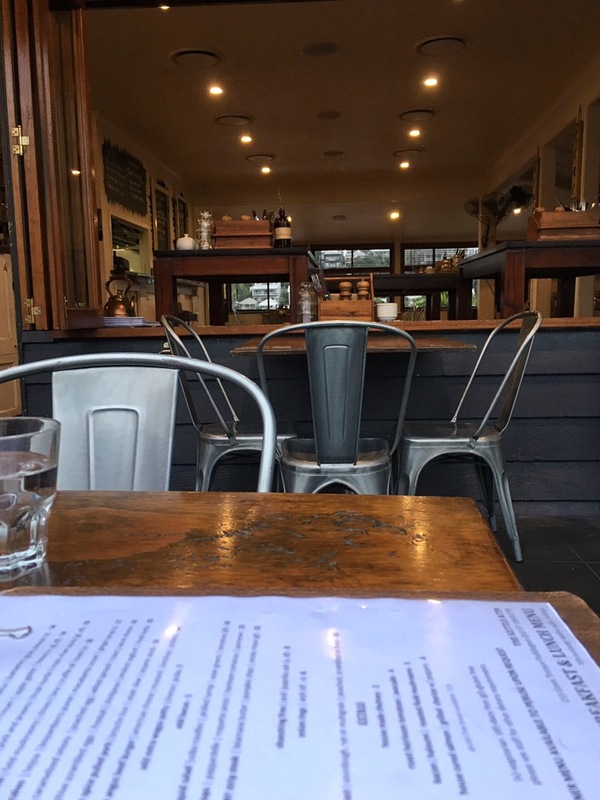 Take some time to linger at Kettle & Tin, there’s always something to see on Latrobe Terrace. Including Locals popping in for takeaway coffees, which meant a ride to the shop for some lucky canines, eagerly watching for their masters whilst guarding the wheels outside. Keep in mind with this one too, street parking can be limited, however followed the driveway down the side of the building to an expansive gravelled parking area. 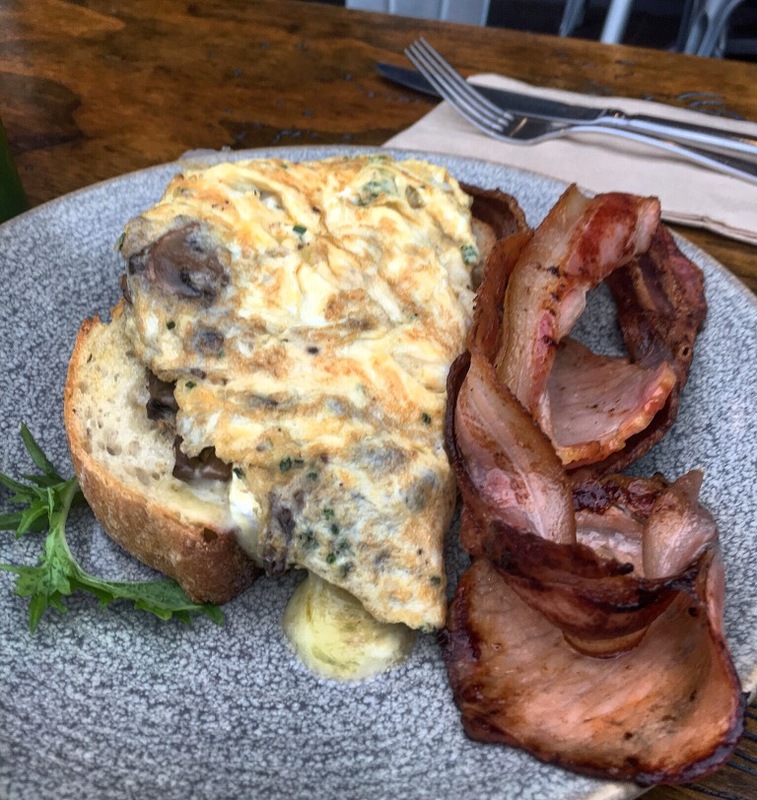 Next time round I’m trying that omelette……..
At some point during life, you have no doubt been told, ” your head is in the clouds”.well up here it truely is. 77 floors up with vistas covering 360 degrees, accessed by a lift so quiet yet very fast. Every window gives a totally different view. Now do you feel like you really do have your head in the clouds? 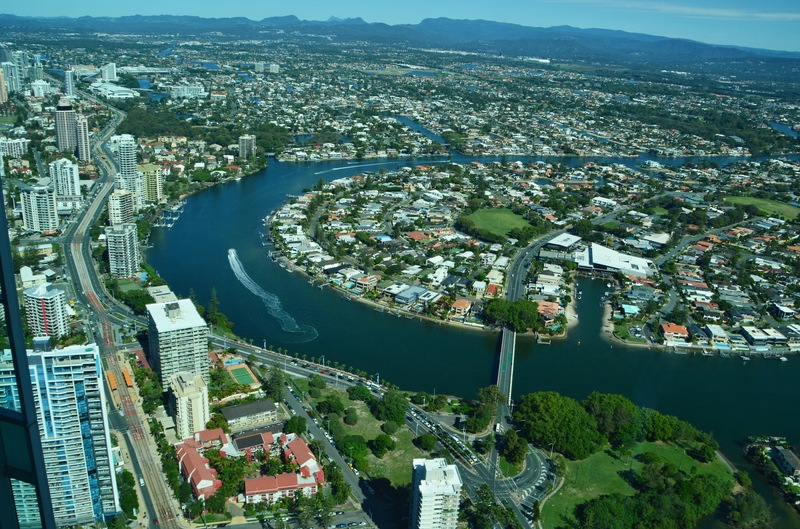 Impossible not to, particularly when you gaze down upon helicopters giving visitors a birds eye view of the stunning Gold Coast. Yes I said down upon. Right now you are higher than those rapidly rotating rotors, which may only be half as high as you are. Dizzy? Maybe, however you still can’t help but peep out through the eyelids to wonder at the extensive moving canvas laid out for as far as the eye can see. Here’s a little perspective for you. 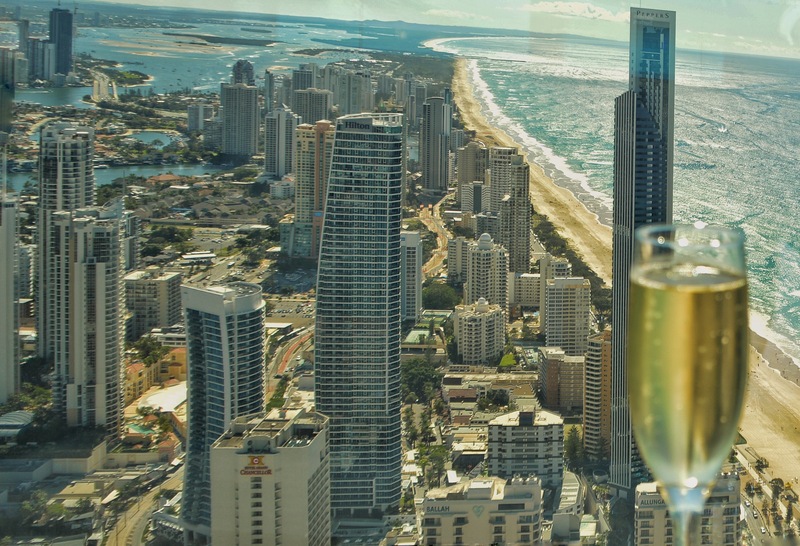 How many floors of the high rise does this glass of sparkling cover? Let’s just say a lot! The total fascination of this place, will no doubt have you tempted to linger. Why not grab a bite to eat, or enjoy a coffee or cool beverage, to give you the excuse to stay. Dotted around this incredibly massively roomy floor area, are comfortable seating settings, as well as a raised floor for the cafe/bar. 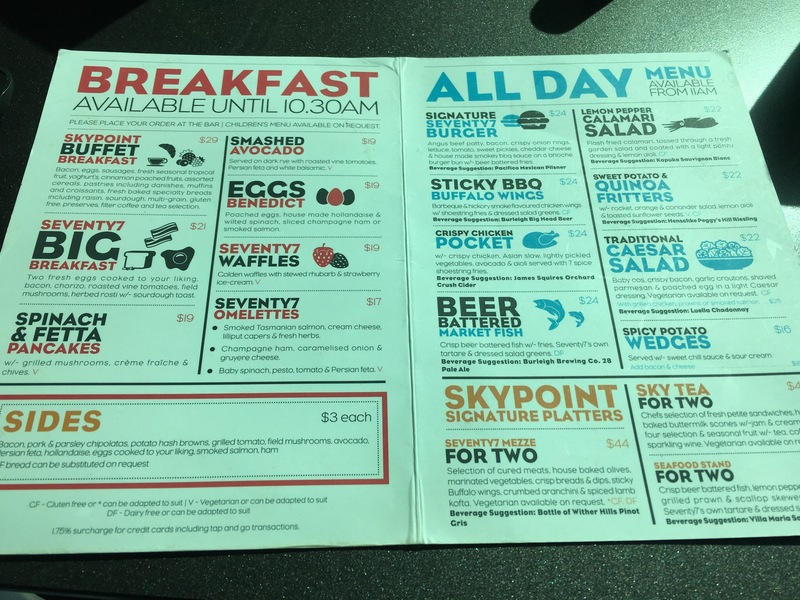 My take on the menu on offer? I would have to say impressed. Simply because anything which yells tourist attraction is generally renown for overpriced average or below food. 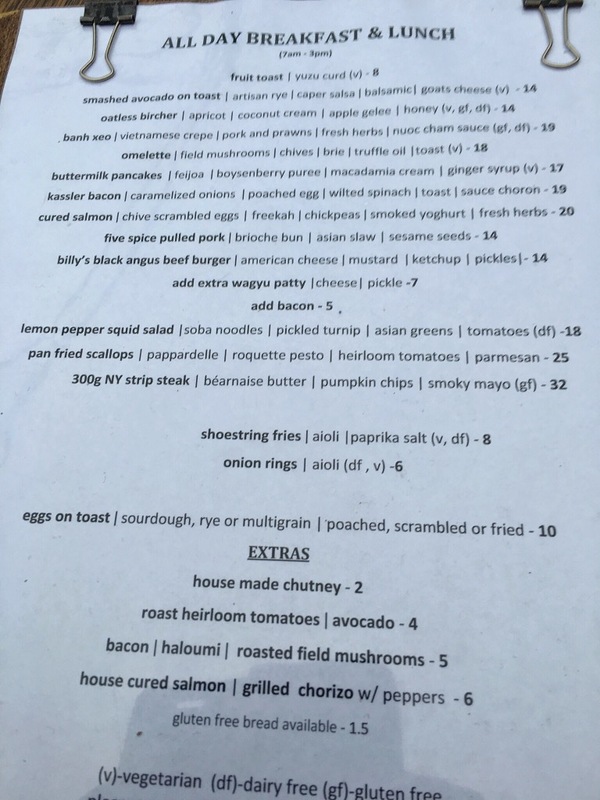 Very pleasantly surprised to find a simple, yet effective, reasonably priced menu. Check the ticket prices online, and keep in mind if you intend visiting more than once a year, you might be better with the annual membership which will give you another 10% off the menu prices. 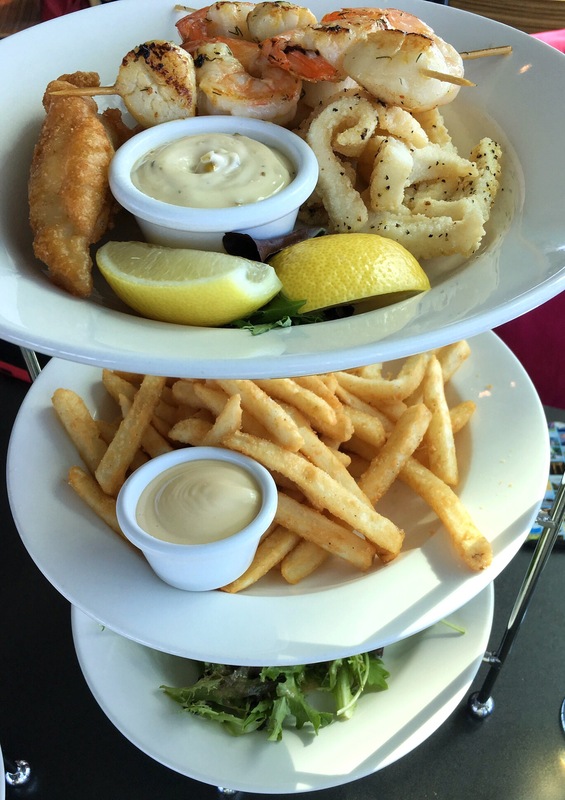 We decided to share the Sky Tea for two, which did seem very popular, and the Seafood Stand. Between three people we found this more than sufficient! Not one morsel disappointed. Everything was beautifully fresh, well presented and extremely tasty. Right down to the delightfully fresh sandwiches on the Tea for Two stand. WOW ! I heard that as soon as you saw the enticing petite four selection on the top. Delighted to confirm they were as tasty and delicious as they look. Seriously, drop by for a visit, you simply won’t be disappointed. I’m looking forward to returning in the evening. Can you imagine how spectacular sunset and/or sunrise is from this fabulous area? Now imagine one of those summer Queensland storms rolling in….See you soon Q1! Road tripping. A fabulous way to explore both new and re-visited areas. 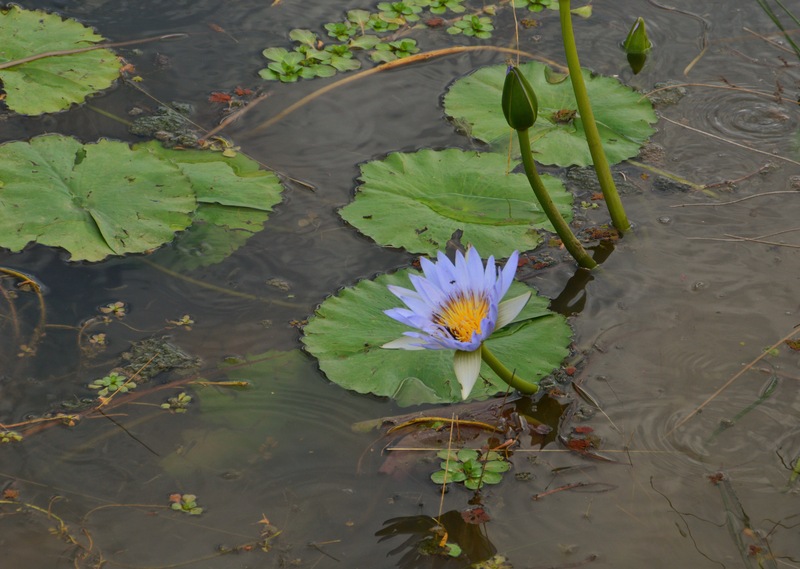 Recently we enjoyed a road trip to an area of Queensland I never before travelled to. The beautiful South Burnett region in Southern Queensland. 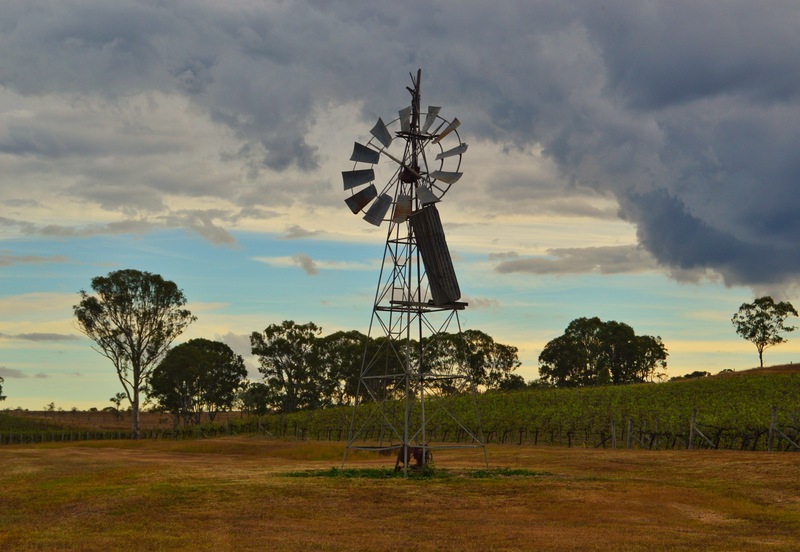 Blessed with two wine regions, the South Burnett and the Granite Belt, Southern Queensland is a fantastic area to visit and sample a large range of produce. 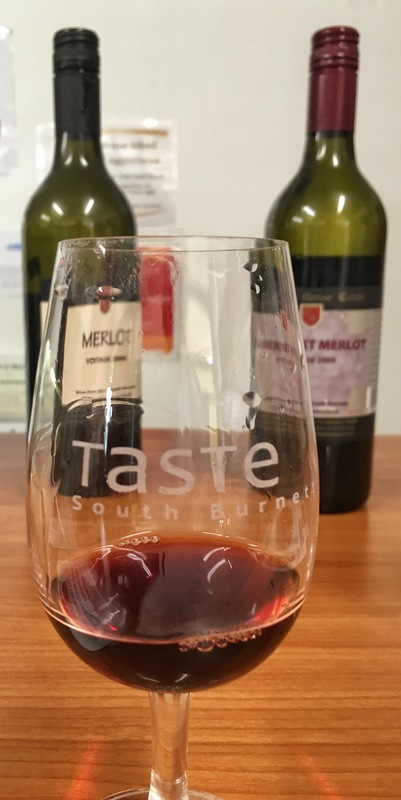 What better place to start than Taste, located in Kingaroy opposite the Woolworths shopping complex. Spot the Taste sign out the front then head down the alley to a delightful little shop showcasing an overview of the produce in this area. Cheeses, meats, olive oils and of course, the wine! Just to name a few. After sampling the wine, select your choice of vino, and don’t forget the selection of cheeses to make your own mouthwatering cheese platter accompaniment. Now if you’re short on time, this may be your only stop. 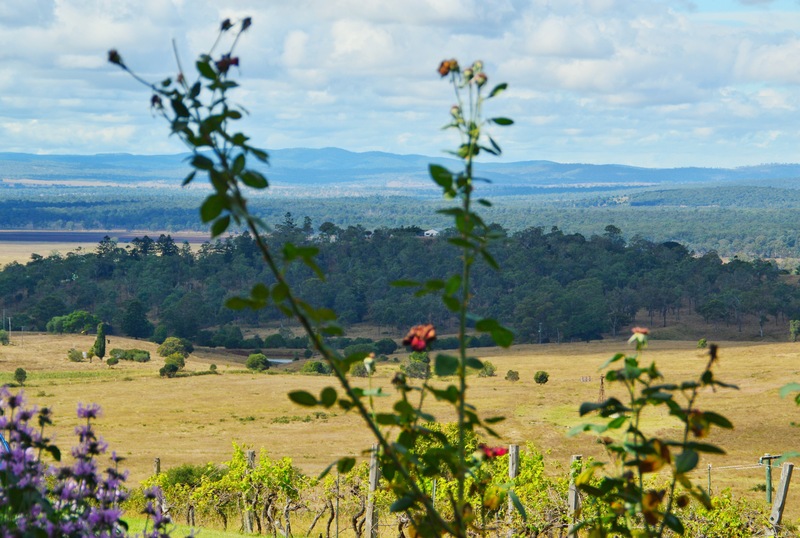 Should you however be here to enjoy the natural beauty offered by the South Burnett, then allow me tell you more! 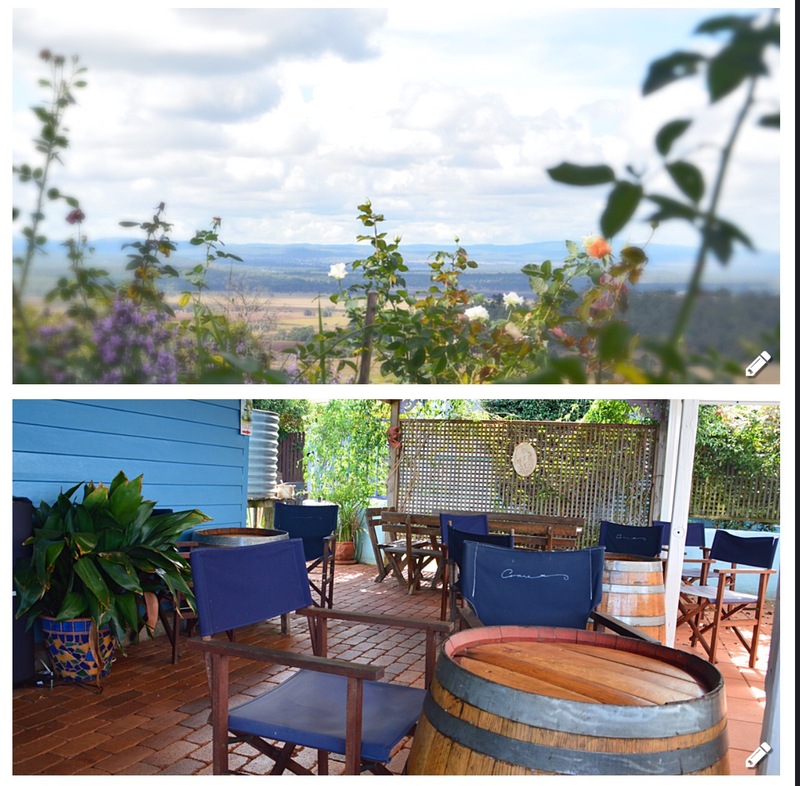 How about a visit to Moffatdale Ridge Wines. A fabulous Tuscan style set up with an array of wines and liqueurs to keep most people’s interest. A large selection is up for tasting here. You are most likely to find something to everyone’s liking. If wine itself isn’t your thing, perhaps a few sips Turkish Delight liqueur will jumpstart your tastebuds! Somewhat interesting is the Tuscan events held here. I myself could definitely wile away some time on the generous balcony overlooking yet another of the areas fabulous views. But, on this occasion, one must take one for the team so to speak, and continue on to the next venue. And here it was, with rolling vistas for as far as the eye can see. All just from visiting the friendly Crane Wines. Yes you will leave the sealed road for the last kilometre or so, but trust me, it is well worth the drive. Friendly personalised service, including being greeted and escorted to the cellar door by a very amiable dog, whose name I have forgotten. 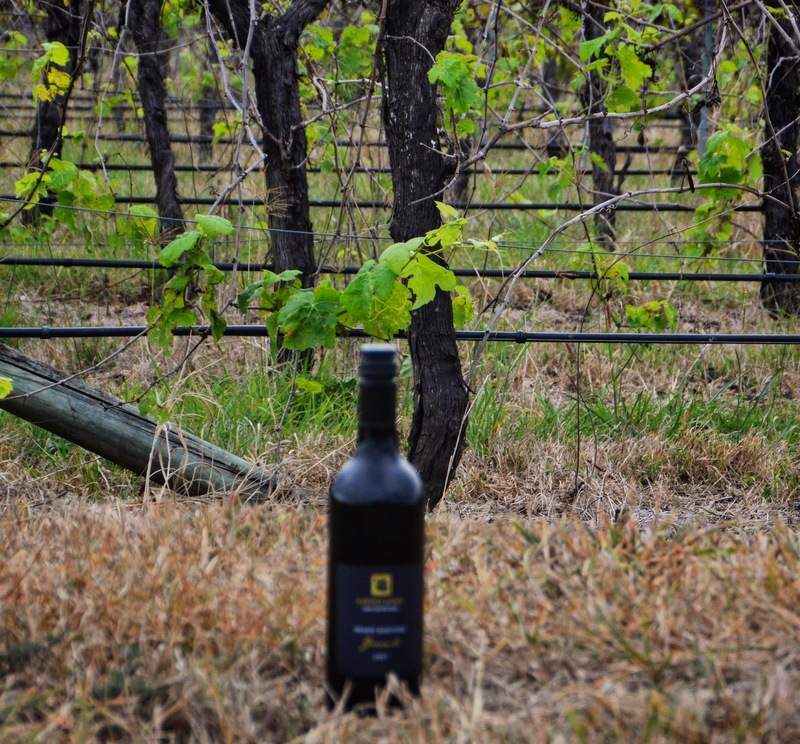 Quite an interesting little cellar door with plenty of interesting wares for you to browse through whilst clasping the wine tasting glass in hand. Love the family, intimate feel, with the owners Bernie & Judy providing information, not just on their wines, but on the area as a whole. Fantastic ambassadors with a passion for their region I feel. Interesting note here, is this was the first winery to open its doors in the region. Stop here for a wile, drink in the pure beauty of natures canvas, from your chosen rustic table setting, whilst enjoying a wine or two with a platter. An excellent way to unwind. In fact if you find you are enjoying your time at Crane Wines, pick up a brochure and consider staying in one of their private, quiet little homes away from home. Again though time to move on. 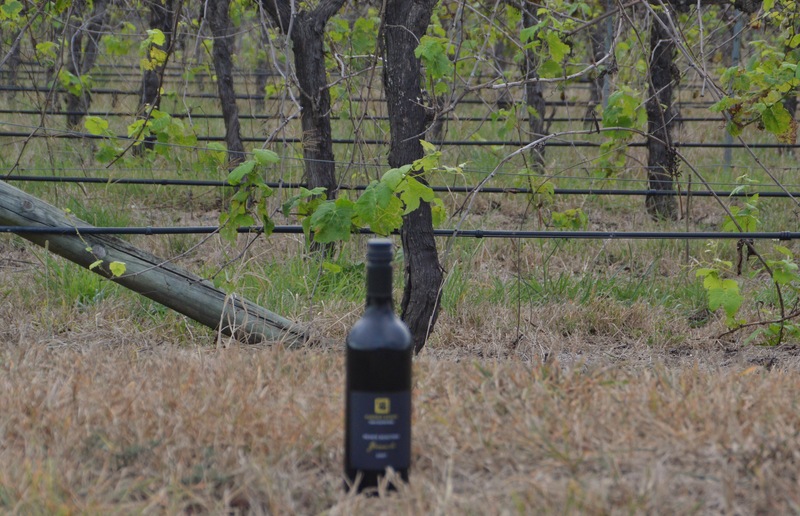 Today it was heading back to the Dusty Hill Vineyard with the Irish pub onsite. Obviously very popular, however the large area gives you plenty of choice in regards to sitting inside or out. Overlooking a pond fall of budding waterlillies, dotted with drifting ducks, geese and other wildlife, all ingredients for a very relaxing setting. 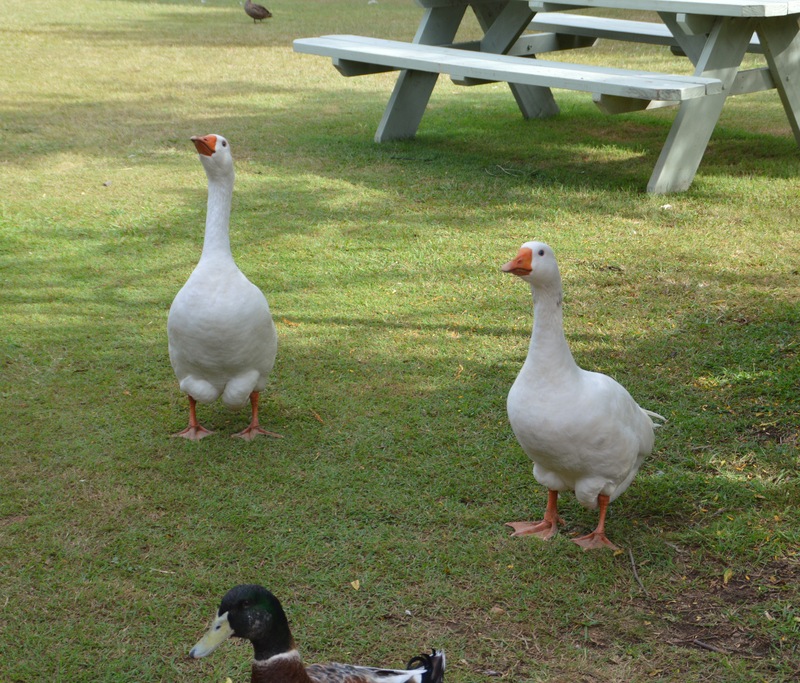 Our lunch today was interrupted by the loud honking of the geese below, who we could only assume were voicing their displeasure at an adjustment to feeding time. To add to their concerns, the drake in front, appeared to be along for ride, hoping to score some of their feed. One goose took exception to his participation, trying vainly to chase him off. The honking worked however, with a bartender arriving out the front clutching a bag of feed, which was distributed down by the pond. Again this did not suit the geese who would have preferred instant food where they were. Not keen on missing out though, the mismatched trio waddled their way after the bartender, demolishing the food he distributed. Now the residents were placated, serenity was restored. Order a Guiness at Prendergasts Irish Tavern, to go with your meal, or to simply enjoy. 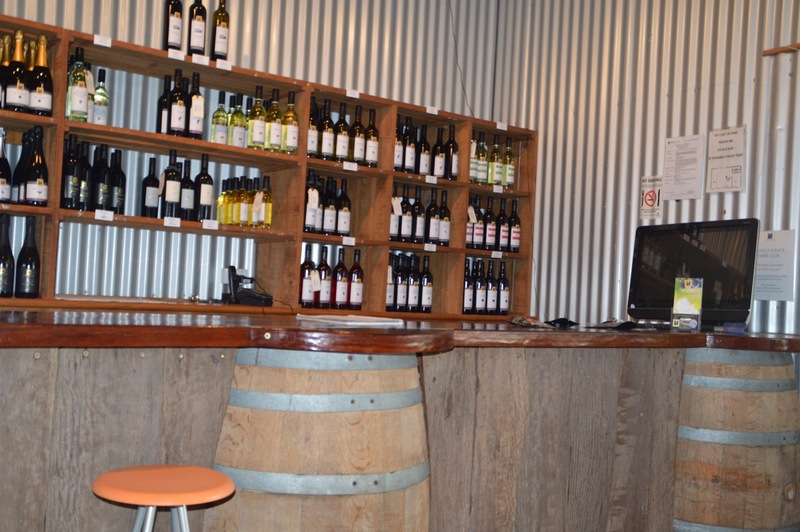 Taste some of the Dusty Hill wine selection in the cellar door, also located within the complex. 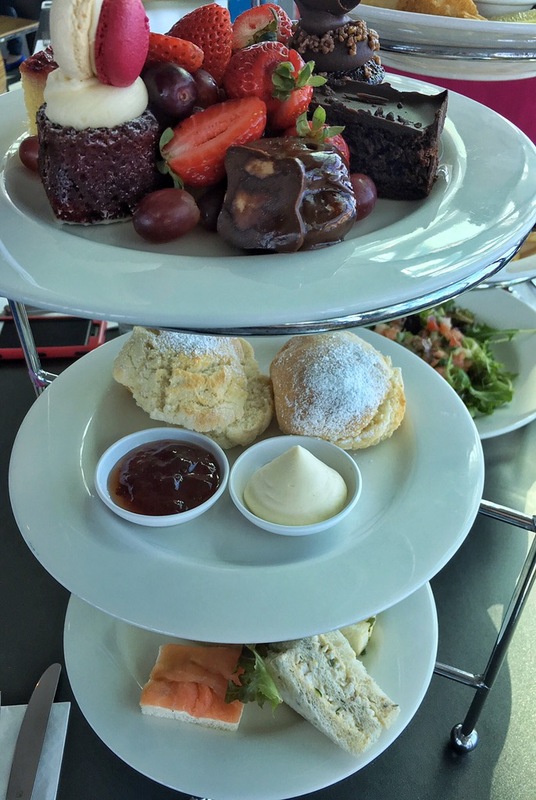 Or, you may even choose coffee and cake, with a delectable selection of desserts and cakes on offer. 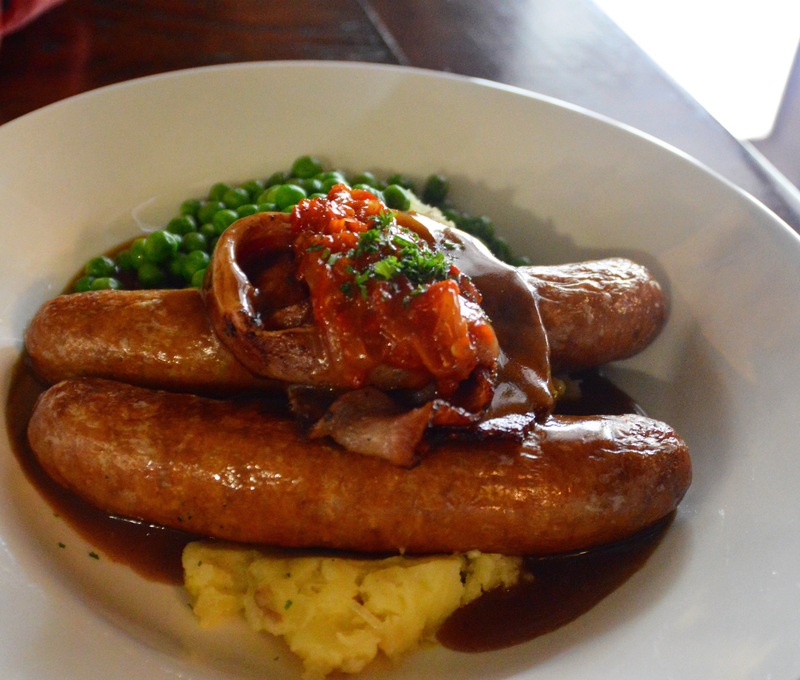 Hubby trialled this hearty bangers and mash meal, which went down a treat. Ideal Guiness soaking food. Our final stop today was the Clovely Estate Winery, where we were staying for the weekend. How fabulous to have your own cellar door at the end of the lawn. Check my previous Clovely Estate review for a glimpse of this wonderful venue. Be sure to visit this friendly, inviting and fabulously interesting area of Southern Queensland. We are already planning to revisit! 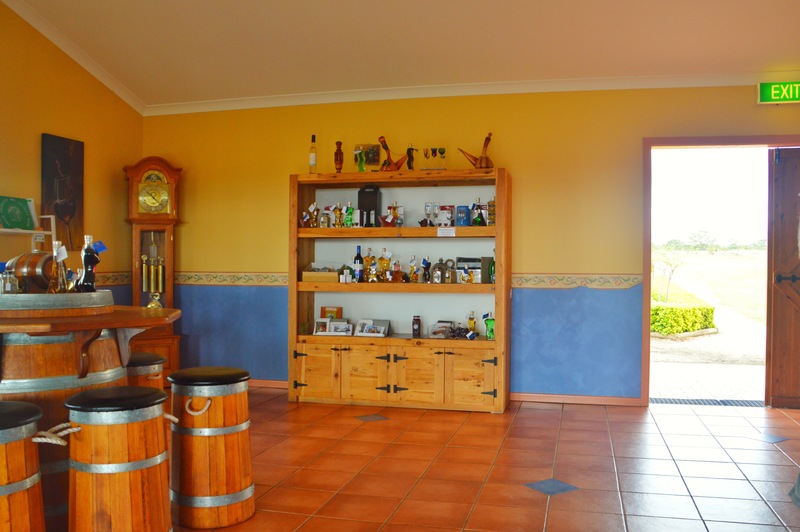 Have you ever dreamed of a cellar door within easy walking distance from your back door? You can make this a reality without winning the lotto, your own piece of paradise for a couple of days. 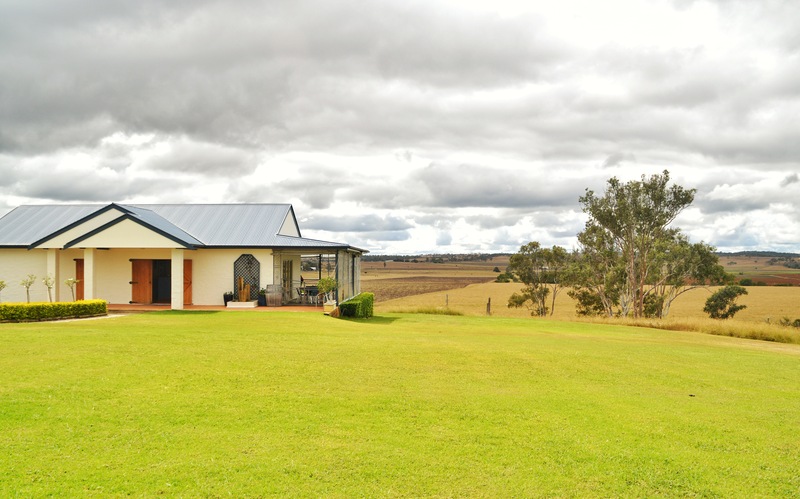 Step out the backdoor of this Queenslander to duck down the end of the lawn for a quick wine tasting, or select a bottle to accompany dinner. 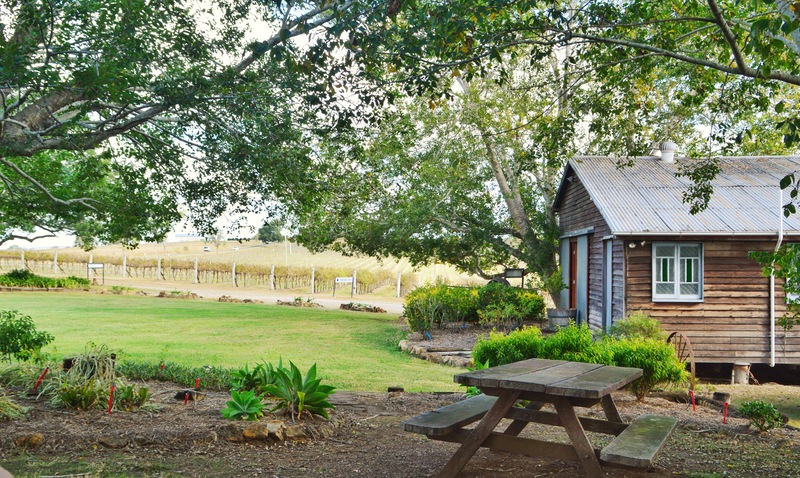 Buildings date back to the dairy farm days, with this shed retaining its old farm charm on the outside, but restored inside to make a comfortable wine tasting setting. For reasonable cost, bring some friends and fill the house, which becomes yours entirely once the cellar door closes each day. Breakfast supplies come with the house including bacon & eggs left in the fridge. Walking into the house is like walking into a home. You will need to bring lunch or dinner food, however all the main kitchen essentials are taken care of, with a barbecue on the verandah. Keep in mind there is an Irish Pub/Restaurant a very short drive away so you may prefer to eat out rather than taking food to cook. 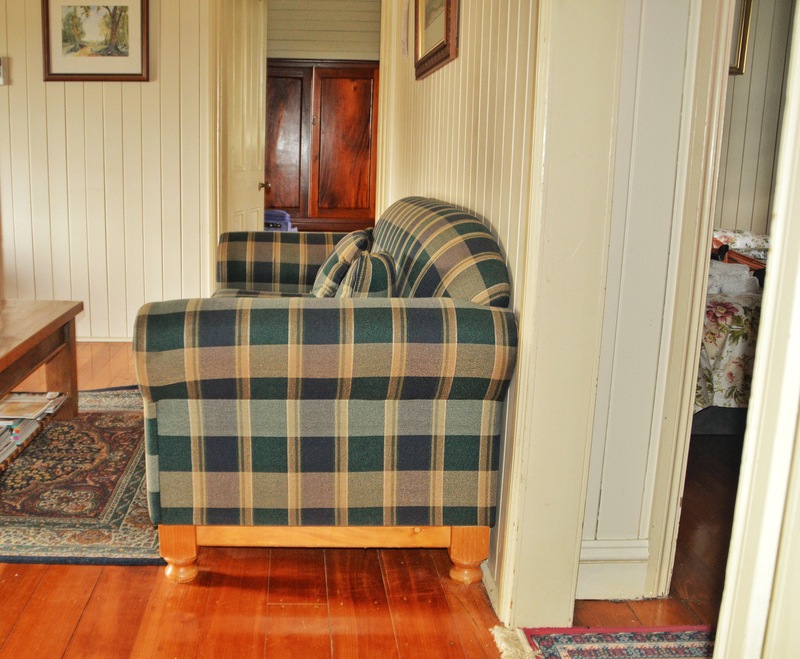 Furnishings are to the era of this close to century old home. 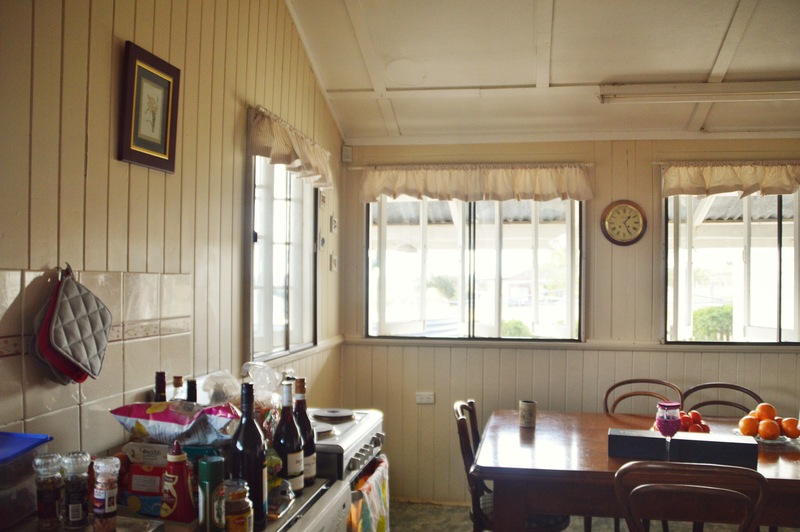 Polished floors throughout, two full bathrooms, 4 double rooms, one with an additional single bed in the room, plus one separate single room, an extra toilet and a huge dining/ kitchen, through to lounge room make the home complete. 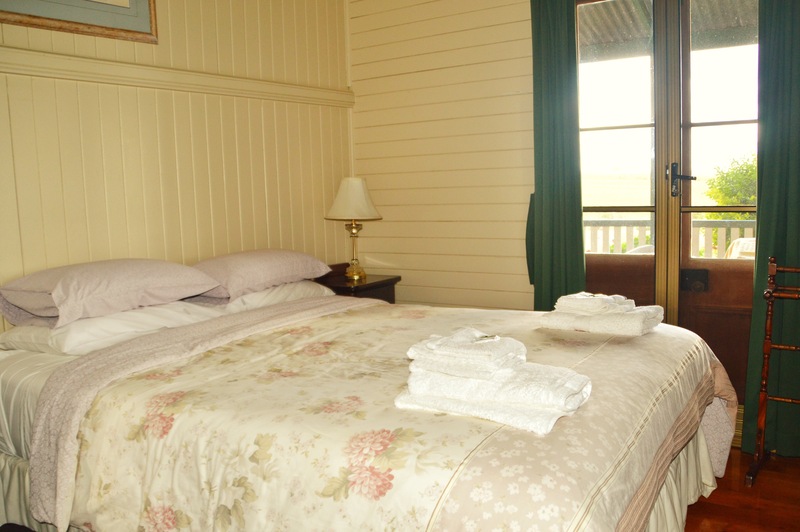 Laundry facilities are in a separate building located down the stairs. Well worth the drive from Brisbane, keep this in mind as a place to visit for a weekend getaway. 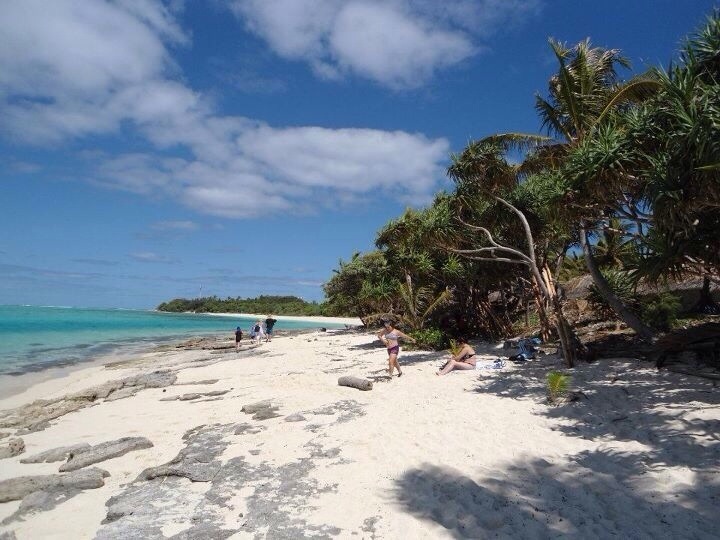 Bring the family or some friends and drink in the peacefulness of this beautiful area. 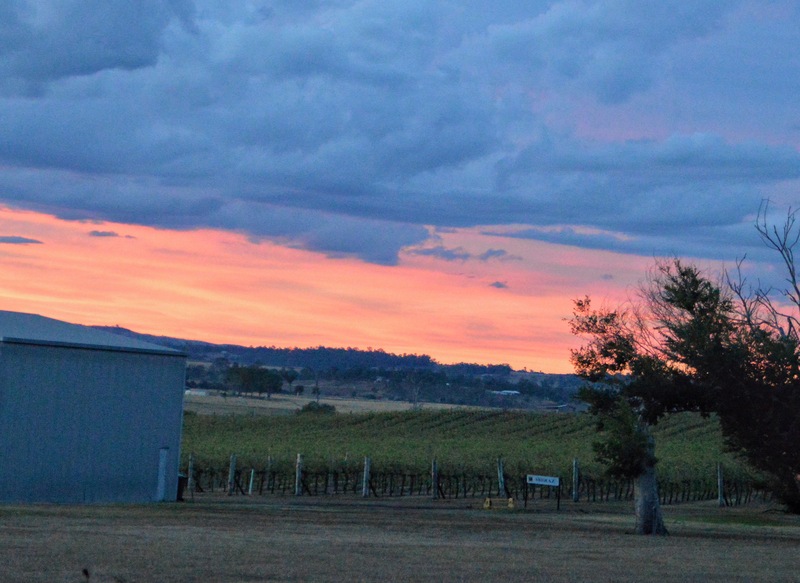 Drink in the beauty of the sun setting over the vines, whilst you enjoy the peacefulness of this beautiful countryside. Gaze upon and uninterrupted carpet of stars on a clear night, no city lights here to spoil the view! Make sure you check this place out! We are already planning a trip back….